In near-future Berlin, a mute bartender searches for a woman, aided and abetted by a pair of sinister American surgeons. Mute is directed by Duncan Jones and was released on Feb 23rd, 2018. 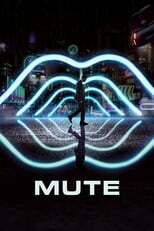 Director Duncan Jones's Mystery & Science Fiction movie Mute is produced by Netflix & Studio Babelsberg & was released 2018-02-23.